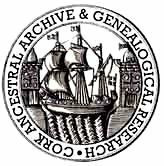 Cork Ancestral Archive & Genealogical Research is a Cork based concern, whose activities are unique, and specific to Cork City and County. As much of the original archival material is held within the various County repositories; we are, therefore, well placed to conduct this much needed service. That said, all other enquiries for outside Cork County shall obviously be considered, depending on the information our client is able to provide. These shall be dealt with through our extensive network of affiliated bodies. Unlike many other online services, we are not a pay-to-view business. Our approach to tracing ancestral roots is of a more personal nature. One of our in-house dedicated team of professional genealogists will be assigned to your case, who shall methodically research your Irish ancestry; reporting back at regular intervals.